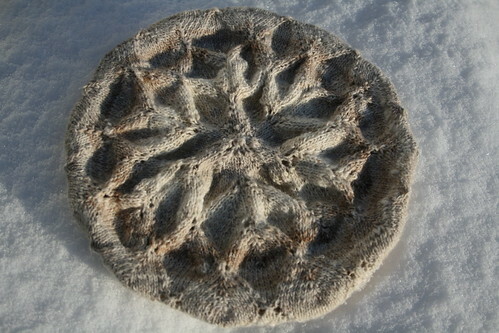 Christmas Knits.. a lace beret. Snowflake like seems to be appropriate- as Michigan keeps trying to SNOW. Hello- global warming? I think not. More soon- I’m working, working, working! test knit pretty! Red is the new EVERYTHING. testing. 1. 2. 3. testing. 1. 2. 3. 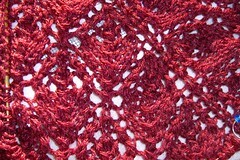 This is a test, it is only a test, of an incredible new lace scarf coming out soon from bellamoden.etsy.com. The yarn base is bamboo/merino. It absolutely shimmers. 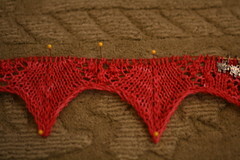 The colorway is spectacular- with just enough variation to add depth and interest without distorting the lace pattern. I am loving this pattern! it’s fresh and unique. I can’t wait to finish! Should be finished and get it plied up tomorrow! In which the microwave croaks and I forget how to cook…. It’s just one of the many things I am culinarilary (just made that word up- I like it) dependant on. Like a magic black box- (sometimes considerably brighter than me) it heats everything from spaghettios to cold coffee-it has faithfullyu served. At least- it was. Until Sunday night. When my microwave gave up the ghost. By Monday night- I could stand it no more. There was no popcorn… I am incapable of cooking vegetables on the stove-top and I had a pile of pans with burnt spaghettios begging to be cleaned (that part isn’t true- I swear FlyLady!- but sounded funny) …so I trudged off to Walmart- in search of a replacement. I stood in the microwave aisle like a deer caught in the headlights of oncoming traffic. I had no idea there would be so many demands on me so soon after my grief. Overwhelmed, I looked from shiny microwave to shiny microwave. There were: White ones. Black ones. Stainless steel ones. Microwaves the size of my first car. Microwaves barely big enough to make a bag of popcorn. 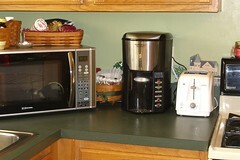 Microwaves with grilling capabilities and microwaves with more buttons and options and computer memory than my laptop. I settled on a (cheap) stainless/black model with a grilling capability. (Which I will probably never use- but- my kids (probably to bring green army men to a painfilled, melting doom) will. As you can see in the pic above- she now proudly sits on the countertop. Maybe, a little too proudly. Although, she’s already proved competent in the cooking of last nights green beans, I have a concern. She seems to be glaring at the toaster and cavorting with the coffeepot. I think she is unhappy with the cultural diversity on the countertop. Apparently the toaster is not of their “ethnicity”. White plastic is frowned upon by the much prejudiced stainless crew. Too bad. It’s my house. In a fit of unoriginal hat overload rebellion- I cast on a new piece of lace that I plan on wering for Christmas. It’s the Flower Basket Shawl- from Fibertrends/ interweave press. A very simple 10 row repeat. 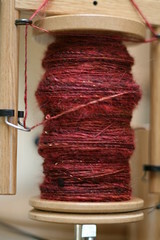 I love the yarn- Zephyr silk/wool laceweight- 2 strands held together- Ruby and Garnet. I’m knitting on US size 5 Addi Turbo Lace Needles. Maybe this will calm my Christmas cleaning- shopping nerves…. more pics are on flickr. And now- to work on painting the trim where the bad cat has scratched away the wood AND the paint….